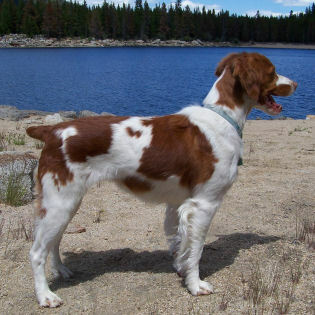 Maggie at a mountain lake, 2007. CH Warbonnet Golden Magpie, JH "Maggie"
Whelped: 12/18/05. OFA Good, Elbows: normal. OFA #: BS-13667G27F-PI. By DC Wyngold's Tough To Touch x CH Wyngold Wyndy Warbonnet. Breeder: Todd A. Breitenfeldt, Warbonnet Brittanys.